First sign of spring in Boston! 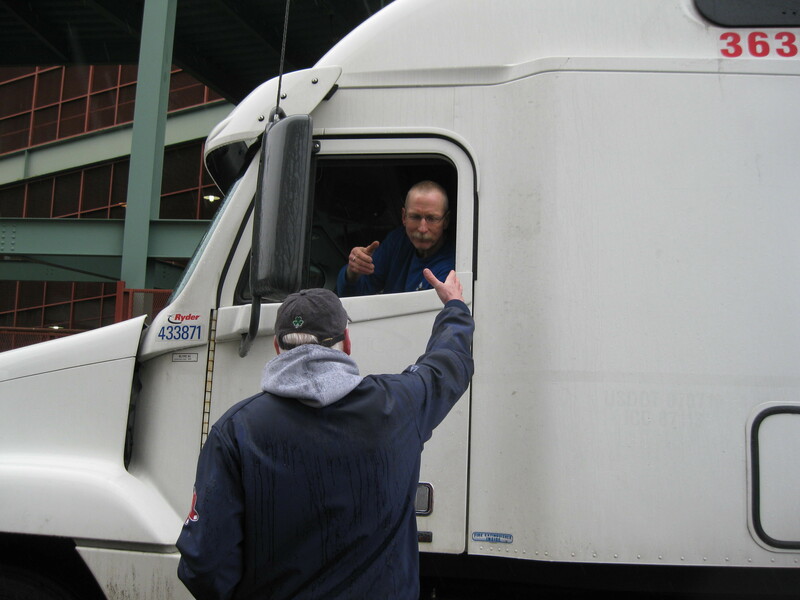 For some people seeing a robin is their first sign of spring, for others it happens when they see the buds of crocuses starting to poke out of the ground, but here in Boston we look for a huge green 18-wheeler, A.K.A. 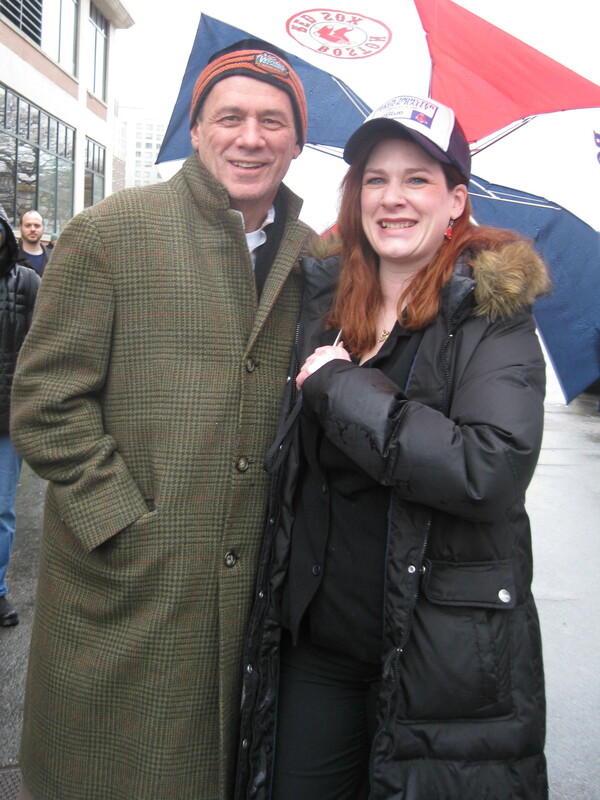 “THE TRUCK” with a soft-spoken driver as our first sign of spring! 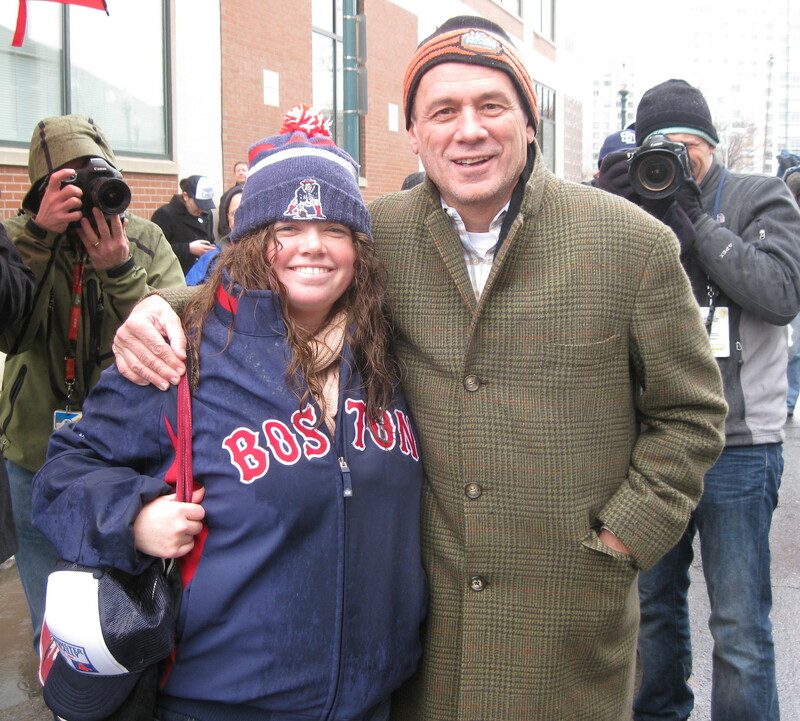 With umbrella in hand, I walked from my office with my buddy, Paul, to Fenway Park. The mile long trek was an adventure unto itself. With the rain coming down, coffee in one hand, umbrella in the other, Paul and I had to dodge snowbanks, puddles and oncoming traffic! 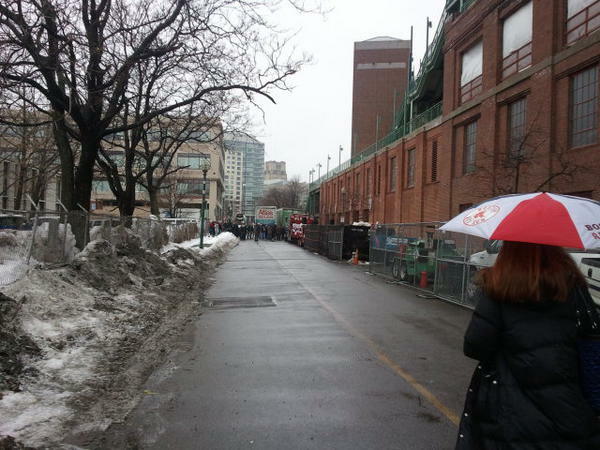 Just after 12-noon, Boston’s first sign of spring rolled down snowy Van Ness St away from frosty Fenway Park and headed to warm and sunny Fort Myers, Florida to beautiful City of Palms Park! 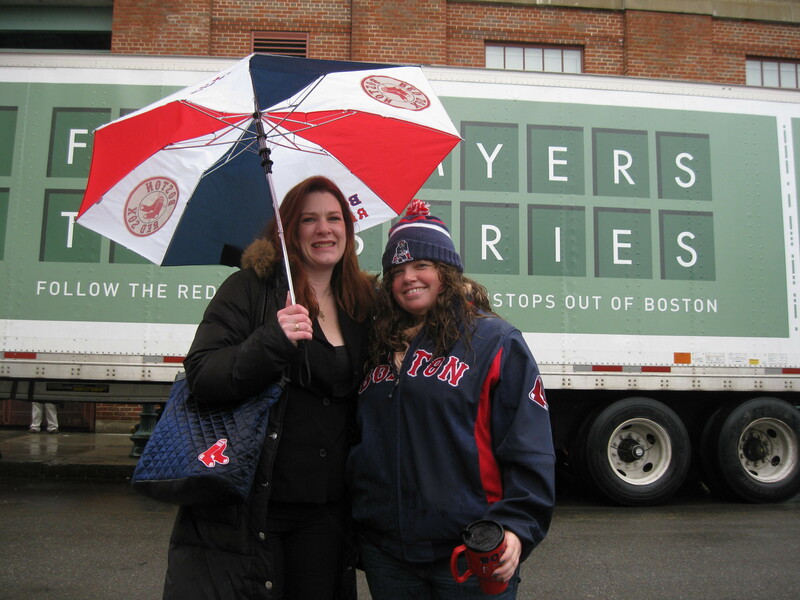 Leading the procession was a flatbed truck with Wally The Green Monster and the Fenway Ambassadors tossing trucker caps and squishy baseballs to the Fenway Faithful crowd who were on hand to bid THE TRUCK adieu. For the 14th year in a row, Atlas Van Lines driver, Al Hartz, will be in command of THE TRUCK. Al has been a lifelong Red Sox fan but doesn’t get to too many Sox games because the summer is his busiest season. 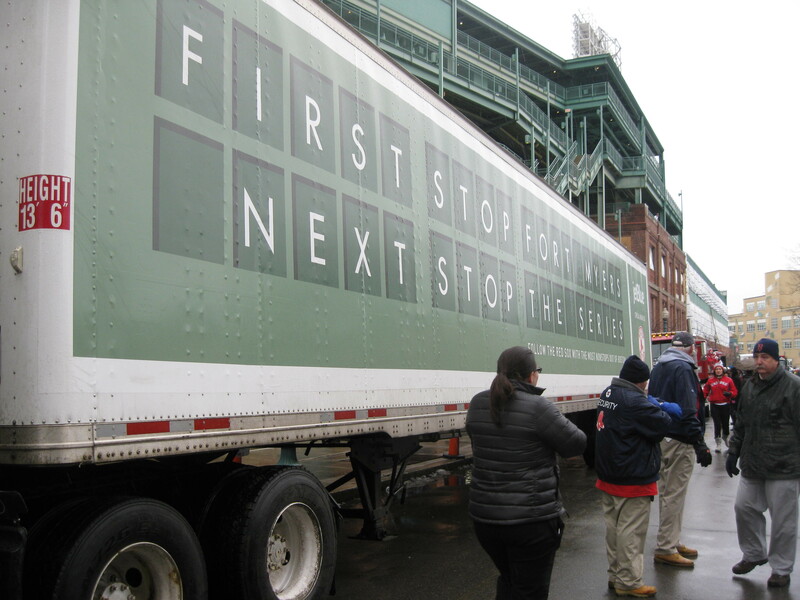 For 12 of Al’s 14 years, THE TRUCK left Fenway with a banner draped on the sides depicting the Red Sox logo as well as the sponsoring company of the event. The only problem was shortly along the route it had to be removed because of the potential hazards it posed to the general public along the highways from Boston to Fort Myers. 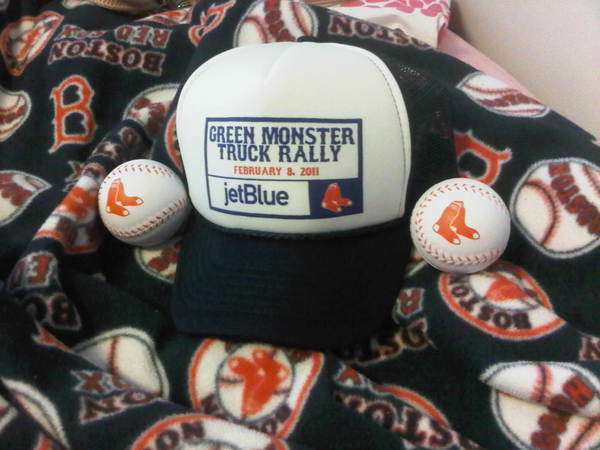 Last year, THE TRUCK was given a complete makeover thanks to Jet Blue! No more banners for our truck, now it has decals on the sides the full length of the truck, that will last all the way to FLA!! Last year Fenway’s Green Monster was spanning the entire length of the truck with Wally hanging off a ladder on the side. 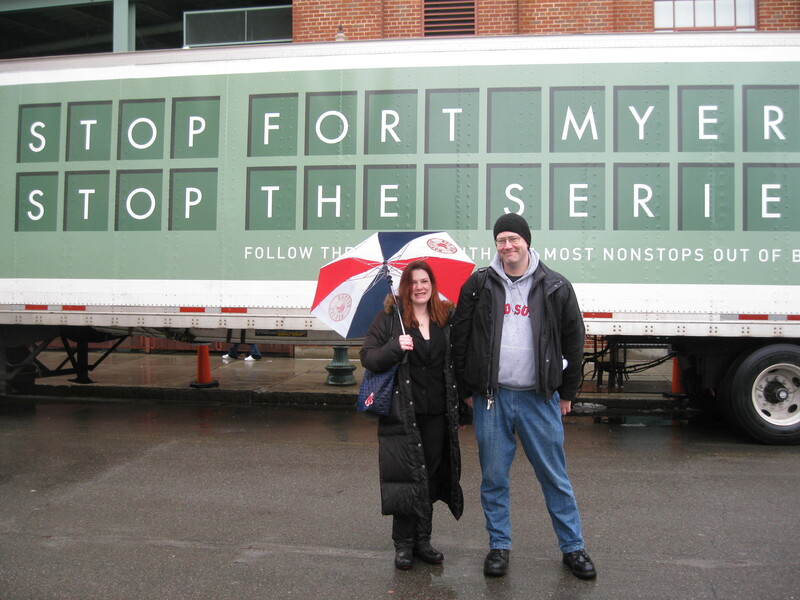 This year it is the Green Monster scoreboard with FIRST STOP FORT MYERS NEXT STOP THE SERIES written in the spaces. “Hope Springs Eternal” is more than just a cliché phrase to die-hard baseball fans; Spring Training brings out the hopes and dreams of the upcoming baseball season to players and fans alike. Regardless of where the team ended the previous season, everyone’s record is spotless and perfect in the spring! The 2010 Red Sox season was one plagued with injuries to so many of our beloved Red Sox players. But we got a chance to see how amazing the Red Sox farm system is with all the guys who got the call to play in the bigs, if only for a few weeks. My favorite moment of the 2010 season was the Daniel Nava grand slam on June 12th!!! A kid who never gave up on his dream of playing in the majors, hits a grand slam on his first ever major league pitch! Daniel received a raucous standing ovation from the excited Fenway crowd that day. I was watching from home but was jumping up and down and cheering just as loud for him. On paper, the 2011 Red Sox team is unstoppable. Everyone who was on the DL last season is healthy, and with a few new additions to key places this team looks amazing!!! 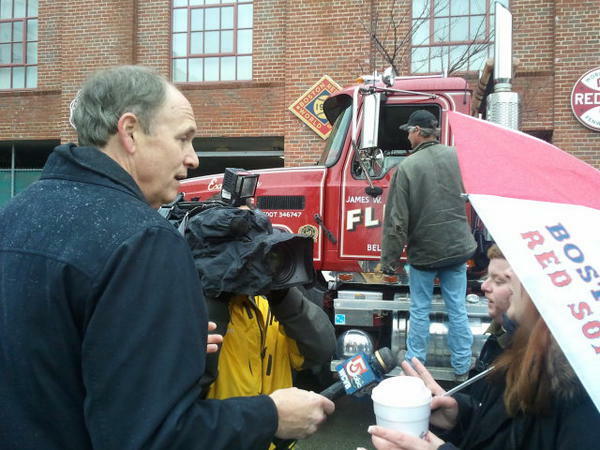 Though this winter has been far too long and snowy for many of us in Boston, our thoughts today turn to spring as Al and THE TRUCK make their journey to Florida. May the pitchers command the strike zone making every hitter cower! May the Red Sox once again stand as baseball’s royalty! GO SOX!!!! WE LOVE THAT DIRTY WATAH HERE IN BOSTON!!! You are currently browsing the Irishredsox77's Blog blog archives for February, 2011.